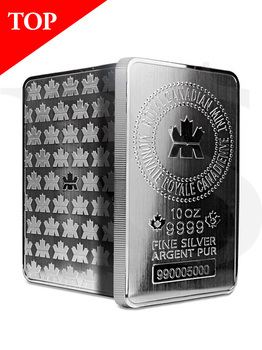 Royal Canadian Mint (RCM) .9999 Pure 10 oz Silver Bar. The Royal Canadian Mint's world-famous family of bullion products has grown once more with the new 10 oz. RCM .9999 Fine Silver Bullion Bar, the world's only LBMA-recognized silver bullion bar to be refined to such a purity. 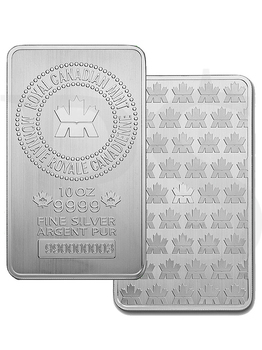 RCM combines quality and purity with the enhanced security of a meticulously reeded edge and stamped with the Royal Canadian Mint hallmark, weight, purity & individual serial number, these are exquisite Silver Bars. As a bar which is struck rather than cast, this premium silver bullion product also features superior relief and the Mint's signature bullion finish. Each 10 oz. RCM silver bullion bar comes sealed in mint vinyl lamination sleeve. These bars are brand new from the mint and come straight out of a sealed mint box. * London Bullion Market Association (LBMA) accredited "Good Delivery Brand"